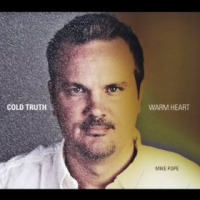 Cold Truth Warm Heart isn't Mike Pope's first album as a leader (it's his third), but in the 12 years since The Lay of the Land (Whaling City Sound, 2002), the bassist has, in addition to some serious life-changers, forged a relationship with two musicians of unequivocal significance. First appearing on Joe Locke's State of Soul (Sirocco, 2002), Pope has worked with the superb vibraphonist and equally fine pianist Geoffrey Keezer in the by turns incendiary and profoundly lyrical Joe Locke / Geoffrey Keezer Group since 2006, first documented on the charging out of the gate Live in Seattle (Origin, 2006) and followed up, six (too long) years later with the equally impressive studio date, Signing (Motéma, 2012). That this positively stellar quartet (also featuring knockout drummer Terreon Gully) has not achieved the acclaim or regular work it deserves is grist for another piece; that Pope, when it finally came time to record the follow-up to The Lay of the Land, chose both Locke and Keezer to be primary contributors speaks volumes. That Mauricio Zottarelli replaces Gully in this largely quintet recording, which also features another potent voice in saxophonist Seamus Blake, is no slight to either drummer; instead, it helps create some distance between Cold Truth Warm Heart and the unmistakable identity of the Locke / Keezer Group, which is primarily a vehicle for the writing of its two co-leaders. 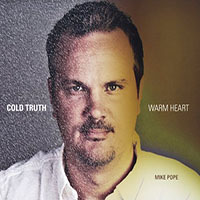 And while Pope's contributions to that group are as significant as those Locke and Keezer make here, with Cold Truth Warm Heart, Pope takes the opportunity to stretch out more instrumentally, in addition to contributing six of the album's nine compositions. That the album burns brightly on Pope's opening title track is no surprisea syncopated, contrapuntally driven tune where Locke sets a high bar with his opening solo that, layered over a bright samba-esque pulse, combines intrinsic lyricism and focused construction with stunning virtuosity, only to have it raised even further when Blake takes over, the ante raised yet again when Pope takes his first solo of the set, a double bass feature that's as impressive for its tongue-in-groove lock with Zottarelli as it is in and of itself. Nor is the deeper, more relaxed beauty of Pope's reconstruction of Frédéric Chopin's "Prelude in E Min Op. 28 No. 4" (with pianist Alan Blackman replacing Keezer on this one track), Pope's unabashedly swinging "Bare Minimum," where Locke navigates Keezer's support like a thread weaving through a needle, or the visceral funk of the bassist's "Shadow of a Doubt"as Keezer deftly blends acoustic and electric piano for one of his most impressive performances of the set, driven by Pope's gut-punching double bass and Zottarelli's in-your-face kit workat all unexpected. Pope's past work speaks for itself; here, on Cold Truth Warm Heart, however, he confidently and creatively takes it to the next level. Pope is no slouch on his acoustic instrument's electric cousin either, though it's kept to a relative minimum on this record. The aptly titled "Out of the Ether" is a complex piece of writing, opening with the group drenched in reverb, slowly emerging as a portent-filled solo vehicle for Blake that's nevertheless predicated on the interpretive skills of the entire quintet, augmented during its intro by a second vibraphonist, Lydia Courtney and defined, throughout, by Pope's slinky fretless electric bass, the group returning to the ether as Locke and Keezer playfully bringing it to a curious close. Locke's arrangement of the eminently lyrical and elegiac title track from his own Dear Life (Sirocco, 2004)the second of two albums with his Four Walls of Freedom group but, with original saxophonist Bob Berg killed in a tragic car accident in 2002 at the too-young age of 51, recorded with Scottish saxophonist Tommy Smith is similarly poignant but somehow stronger, though this time Locke solos after Blake (preceding Smith on the original), leading to a similarly definitive but different conclusion to a song that also brings Cold Truth Warm Heart to a close. If the life events of Pope's past few yearsthe joys of parenthood, the scare of a 2011 strokehave taught Pope much about the cold truths and warm hearts referred to in the album title, they've also been life-altering events that have ultimately (and, thankfully, with Pope back to good health) enriched rather than ruined his life. We are, after all, the sum total of our experiences, and it's unlikely that Pope could have made a record like this without the many events of the past decade, good and bad. But when the result is an album as strong, as purposeful and as superbly conceived and executed as Cold Truth Warm Heart, there's little doubt that Pope has gained from those experiences. The strongest record he's released as a leader yetand certainly as much a consequence of his writing and playing as it is the participation of some of the best players on today's sceneit's an album that begs for a follow-up...and hopefully not 12 years down the road. Track Listing: Cold Truth Warm Heart; Shadow of a Doubt; Bare Minimum; Romance; What I Meant to Say; Out of the Ether; Prelude in E Min Op. 28 No. 4; Ral and Tonto (For Ricky and Nicky); Dear Life. Personnel: Mike Pope: acoustic and electric basses; Seamus Blake: tenor saxophone; Joe Locke: vibraphone; Geoffrey Keezer: piano and Rhodes (1-6, 8, 9); Alan Blackman: piano (7); Mauricio Zottarelli: drums; Lydia Courtney: additional vibraphone (6, intro).